The DLS 27-25 features a Two-Step Voltage Jack which allows switching from a long-term float voltage to an increased rapid charge by simply inserting the dual voltage plug (included) into the jack. Using state-of-the-art, switch-mode technology, the DLS Power Supply series is engineered with the user and variable environmental conditions in mind. Extra care has been given to insure many years of service-free operation, even when subjected to extremely harsh conditions. Batteries are charged quickly and efficiently without over charging and pumps, motors, and fans operate perfectly for prolonged life. IOTA Engineering uses advanced switch mode technology to bring to market highly sophisticated electronic converter/power supplies at appealing affordability. Exceptionally clean DC output insures pumps, motors, fans, and lights work perfectly. This means longer life for any connected load; virtually no AC ripple to cause static or premature failure of radio or television equipment. The DLS series converter/charger quickly and efficiently charges batteries from the full rated output of the DLS. The DLS then maintains the batteries, only putting into the battery what is required by load or self discharge, cutting back to milliamps as the battery requires. Low and transient AC line voltage is a major cause of converter/power supply failure. The DLS series converter/power supply is protected against low line voltage, as well as spikes coming from the AC power source or from improperly adjusted generators. The DLS series converter/power supply meets F.C.C. criteria, minimizing radio and television equipment interference, especially on the lower frequency bands. 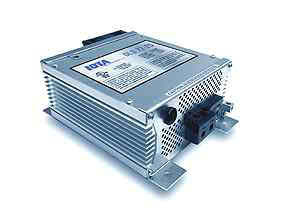 The DLS series converter/power supply can be used with or without a battery. When used as a converter/power supply, the DLS model will only supply what is required by the load. When not in use it is essentially off, reducing electricity usage. Even in its subcompact size, the DLS series converter/power supply, at full load, has an operating temperature half that of some switch mode electronic models. This means substantially longer life and safer operation. Tight line-load regulation ensures that the output voltage holds steady from no load to full load. This keeps pumps, motors, and lights working at the correct voltage even during brown out situations. Proportional Fan Circuitry provides an extra measure of protection. During times of heavy load demands, the automatic circuitry will activate the fan before thermal stress can occur on any internal components. Reliability and durability is built into all DLS models. In the event the batteries or the DLS unit is wired incorrectly, the DLS converter/power supply is protected from damage. External fuses can be quickly and easily replaced.